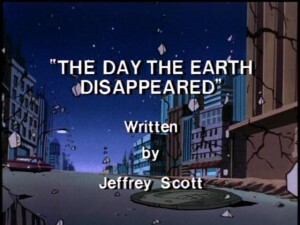 This episode opens with buildings breaking apart, cracks open in the sidewalks and street. The Turtles climb out to the street through a manhole cover and wonder what on Earth is going on. Suddenly the Dreggnaut appears in the sky and hundreds of armed bat-men jump out and advance toward the Turtles. Dregg is also transported and starts battling the Turtles. They succeed in getting away from him once again. Dregg is furious but he has another plan. With Mung’s help Dregg reprograms the transporter to open a warp in space instead of sending something through space. Donatello checks his computer readout and realizes that the warp is growing at a rate of three thousand miles an hour. In two hours it could be big enough to swallow the Earth. On the other side of the warp is Dimension X, so the TMNT immediately know that Dregg is behind it. They have to figure out how to stop it! Leonardo, Donatello and Splinter are sucked into the black hole. 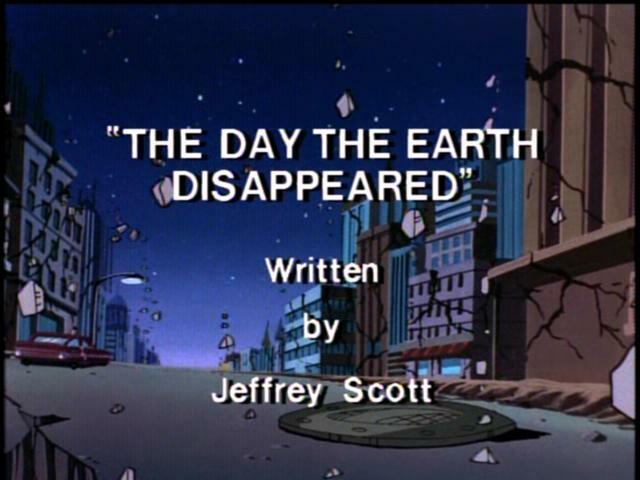 They lose Splinter and land on a planetoid. Michaelangelo and Raphael also get sucked in and wind up on another strange warp world. Meanwhile, Splinter lands on the Dreggnaut and attempts to override the transporter controls. He battles the bat-men. Back at the Lair, April is at the computer trying to get the portal to open. She hits a button, but the portal continues to shrink and swallow up the Earth. Donatello and Leonardo are transported to the Dreggnaut, then Michaelangelo and Raphael appear. Splinter presses the button that will transport the black hole into the ship and destroy everything. The Dreggnaut gets sucked into a black hole! The Turtles and Splinter are transported to the Lair.